We are always happy to partner with quality sites for mutually beneficial link exchanges. Add our link to your site using the information below. *No links to adult web sites. *A reciprocal link must be provided from your site to ours. *Your site must relate to gifts, jewelry, fashion, women's issues or contain items that are handcrafted crafted. 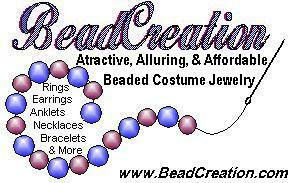 Description: Quality handcrafted jewelry at affordable prices. Large selection of fashion earrings, beaded necklaces, lace chokers, scarves, bracelets, anklets and more!.